The impact of SMR technology is fortunately mitigated by the boost in areal density, and given its price, this drive is a must-buy if you're looking for a pocket-sized storage device. While most recent storage breakthroughs have involved mostly SSDs and non-mechanical technologies, hard disk drives still hold most of the world's data and, for most of us, are the only financially viable option for bulk, mass storage beyond the terabyte mark. The 4TB Samsung M3 Portable otherwise known as the HX-M401TCB/G, which was launched a couple of months ago, is the perfect example of how far spinning, traditional hard disk drives have moved over the past 10 years. It took 2.5-inch models a mere three years to catch up with their bigger 3.5-inch cousins and while the capacity of the latter only doubled over that period, that of the smaller devices has quadrupled since 2011. Managing to cram 4TB into such a small volume means another thing – the Samsung M3 Portable offers by far the highest storage density of any hard disk drive on the market. The drive measures 82 x 118.2 x 19.85mm (W x D x H), which translates into a volume of 192 cubic centimetres and a storage density of just under 21GB per cm^3 – that's close to 50% higher than the Toshiba 3TB Canvio Basics we recently reviewed, the storage density of which stands at 15.5GB per cm^3. 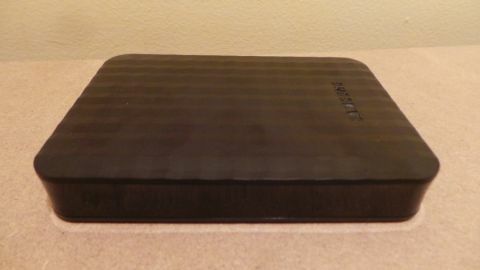 Samsung Storage, which was purchased by Seagate a few years ago, managed to offer such a storage capacity by squeezing five 800GB platters into the drive. While we didn't manage to pry open the device's case, the drive used appears to be a Momentus one from Seagate, the ST4000LM016 (AKA Spinpoint M10P), a model that doesn't even appear on the HDD maker's website. CrystalDiskInfo states that it has 16MB cache and a rotational speed of 5400RPM. What it didn't highlight was the fact that it is one of the first, if not the first 2.5-inch SMR hard drive on the market. SMR or Shingled Magnetic Recording is a storage technology that allows more data to be crammed on a platter in a way similar to shingles on a roof (hence the name). Its biggest flaw though is the fact that it is much slower than traditional hard disk drives when having to deal with random writes for small files – one solution would obviously be to compress them into one big one to accelerate the file transfer. On the outside, the drive is similar to many of its competitors. It sat comfortably in the palm of my hand, has an indicator LED, a flat USB 3.0 connector, but there's no power button, and the Samsung logo adorns the top facia, which itself sports what the manufacturer calls a durable black design. I'd call it a funky 3D finish. The drive comes with a three-year warranty as well as a number of bundled applications, the main one being Samsung Drive Manager which comprises of AutoBackup – a backup solution, unsurprisingly – SecretZone, a data protection solution, Secure Manager, a secure external HD management solution and Samsung's External HD management tools. It was one of the better performers on PCMark 8 in recent memory and easily the best 5400PM portable drive we've seen for a long time, its score of 2139 being fractionally higher than that of the 3TB Toshiba Canvio.